Bard. Zeus. Aramis. Apollo. Shaw. 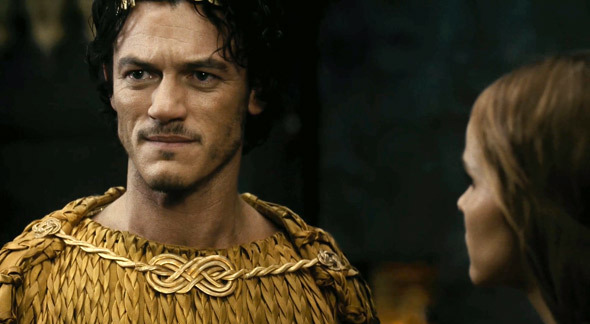 Welsh actor Luke Evans seems to play characters that often have short names, but powerful voices. 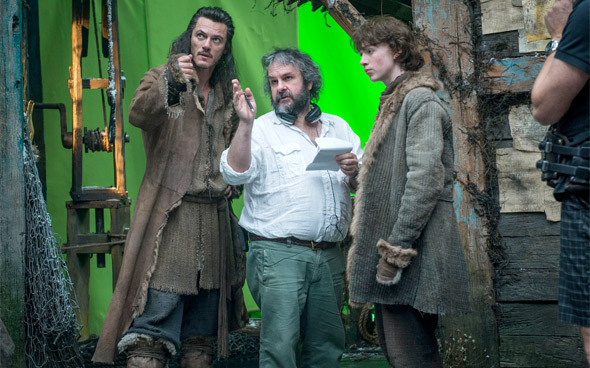 He's on the rise recently and will break out big with his latest role as Bard the Bowman in Peter Jackson's The Hobbit trilogy. He didn't even get the job until halfway through shooting the first movie, then went down to New Zealand for a year and a half of filming, now he's about to go down in history as Lake-town's savior. I first met and interviewed Luke back in 2011 discussing Immortals, and I followed up with him for another interview this year about Bard, The Hobbit, Dracula, The Crow and more. It has been a while since I last spoke with you. I believe we last talked during Immortals. Luke Evans: Wow. That was a while ago. I know. It feels like it… And now we're into Hobbit mania. To start: when you are shooting this, are you familiar with how much you are shooting? Do you know exactly how much of yourself is going to be in the movie? How many days did you shoot specifically? Evans: Oh, I have no idea how long. I was there for about a year and a half all in all. So, I shot a lot. But, no, I don't think you know what you are shooting. You don't know what is going to be in the film - that's up to Peter. But you just… Well, you hope you are in it in some capacity. Well, of course Bard is going to be in it. But, as you say, to what capacity? Evans: Well, I knew Bard's journey and I knew that they were expanding Bard's story, giving Bard much more breathing space, which I thought was a good thing. So… I'm very happy with how Bard has come out in the second film, very much so. Did Peter Jackson come right to you for this? What's the story behind how you got the role? Evans: I auditioned for it along with probably many, many other guys my age. And then I didn't hear a single thing for about 18 months, so I assumed it had started and somebody else had got it. And then, out of the blue I had a phone call asking that Peter Jackson wanted to screen test me in New Zealand. Because they had already started shooting the first movie, I was like, "Really? It wasn't somebody else that had it?" They went, "Nope. They just hadn't cast it." So I couldn't go to New Zealand because I was just about to go to shoot a movie in New Orleans. So then I did the screen test in London and they sent the whole screen test online to Peter in LA and in New Zealand, and the following day I woke up to the offer. And now it's history… you are Bard the Bowman, in a sense. Evans: I am. And it's a very nice thing to know that I'm originating a character from a very famous book, and forevermore my face will be Bard the Bowman. Were you familiar with the book? Obviously you are familiar, but how big of a fan were you? Evans: I was familiar with the book. I really liked the book. And I loved the Lord of the Rings trilogy. I really enjoyed those movies a lot. So I was very aware of the fact that a movie was being made and the fact that I wasn't part of it. So when I actually did get the role, the excitement there was quite intense. I was very, very excited. In the process of preparation for this, did Peter have you go back and re-read the book? Or did he work with the cinematic version he came up with? How much did he put you through? Evans: Yea, well, it would be foolish to not have read the book. Peter didn't ask me to read it. I'm sure they assumed I would have read it anyway. I did read it. But when I got to New Zealand, I put the book down and picked up the script. Then we basically worked off the script from there on in, obviously referring to the original storyline every now and again in the book. But they added lots of new story; parts of Bard's storyline have been now fleshed out. And we now get to understand a little more about his background, and his family life, and where he lives, and the problems he deals with on a daily basis. And also, you see his animosity towards the dwarfs when he finds out exactly why they are in Lake-town is that they want to take back Erebor, their mountain, which has got a dragon sleeping in it. I thought it was very nice and clever how they made Bard's storyline a little bit more active. He's a bit more vocal than he is in the book, just so that you get to know him a little bit more before he does that amazing thing in the third movie, which we don't obviously want to spoil. But it's a big deal. Being so involved with this for so long, a year and a half as you said, are there any moments where you get to provide input into fleshing out the character of Bard beyond just how you deliver your lines? Especially with your kids in the movie…? Evans: Yeah. The whole thing was just a very open dialogue from the second we started the movie. There were lots of different things I had an opinion on. And Peter listened, and sometimes we worked it in and sometimes he had a very good reason for not adding it or going the way I wanted to go. But most of the time we were both on the same page and I totally got what he wanted and what he wanted to portray with the character. I guess it sort of worked very well with what I had anticipated to do with the character as well. I do like what we get to see, at least in the second film, of Bard. I kept thinking to myself, "There is a lot more here that really needed someone"—to compliment you—"of your talents to bring that nuance to the character beyond just being another guy in Lake-town." Evans: Yeah. He's way more than just a Bowman. He's a family man and he lives in this incredibly sort of controlled, corrupt state, which is Lake-town. And he's sort of the people's hero in a way. They see him as one of their own. So when he speaks they sort of listen. And he has probably more respect than the master of Lake-town, which is why the master of Lake-town does what he does in the second movie and gets him put in prison because he seems like a troublemaker and he's stirring up the mutiny. I have to admit that I love the Lake-town set. How big is it? How much do you guys actually have to work with? Evans: Oh, it was huge. It was absolutely enormous. It'd take you a good 20-25 minutes to walk all the way around it. And then, if you were on it, you would just discover bridges and paths and streets and courtyards, all stilted above the lake which was built inside the K Stage in New Zealand, which is the stage that Peter built for the King Kong movie, which is the biggest sound stage in the southern hemisphere now. So it was enormous. For the actor, that's wonderful because you don't really see the edge of the set when you are shooting. And for Peter it was wonderful because he could shoot from so many different angles. There were no fake backgrounds. The buildings, you could do a 360 and three dimensions on the inside and out. Give or take what we'll see in the third movie, how much of a balance between the practical and the CG realm is there? Does it feel like you are completely in it or are there still CG pieces while you are shooting? Is there still a little green screen in the background? Evans: Yeah, there are. There's green screens in the background, like at the ends of streets or something. The walls around the sides of the soundstage were all green so anytime they were in the shot that's where the CG mastery came in and they'd paint something in or paint something out, or whatever they needed to do. But on Lake-town, you could quite easily blank the green screen out because you are working with real, tangible wooden structures, and props, and animals, and people, and rivers, and lakes, you know, all of that stuff. It was very, very easy to just immerse yourself in that set, very much so. The other thing that impressed me is the way the sizing of the characters feels seamless and how much bigger you are compared to the dwarfs and Bilbo. How, from an acting and filming standpoint, does that work? Are you just standing on an apple box the whole time? Evans: No. That would have been the easy solution, yes. But, unfortunately, it's not. There is a more technical and more effective way of doing it which they have designed out in New Zealand. It's called Slave MoCon, which is slave motion control. What it is, basically, there's a scene in the film which I do with the dwarfs in my house when I bring up the weapons and put them on the table. Like you said, they are much smaller than me and I'm looking down at them. So what they do is—we rehearse together in the morning, and then the dwarfs go off to "my" house, which has been built a third larger so they look smaller, and then I go to a green screen set where everything is green, the table; everything like in my home, but it's all green. And then around the table they put sticks with photographs of the dwarfs on the sticks in the right order around my table, and each one has a light above its head. And I had an earpiece in my ear. And then we would do the scene as is, but all I would hear is them speaking and then a light would come on if it was Gloin, or if it was Thorin, or Balin, depending who it was. And that's how we would do the scene. And then what would happen is one camera on the dwarf set was the master camera. The camera that was following me was computer controlled and it was the slave camera. It moved to keep me in perspective and make me look larger. And then the two screens were then merged into one in Peter's playback tent so he could see immediately the effect. And then he would just tweak my eye line or their eye line so that we all looked like we were looking at each other. And that is how magic is made. I mean that is it. It's an incredible—it's a very slow, very technical process, but my God. When it works, it really, really works. One other scene I noticed it in very much so when I watched it last night at the premiere was in Beorn's house when Gandalf was with all these dwarfs walking around. It's incredible. It's absolutely incredible. I figure it must be rather challenging for you to not act with the actual actors in the same room. You are playing off of, I think you said, just these faces and lights, right? Evans: Yeah. I wouldn't like to do a whole movie like that, that's for sure. It would have been a very lonely experience and I probably would hate the color green. But of course you still get some scenes where you get to go out and stand in the middle of the set and be awesome and not have to worry about all that. Evans: Yeah, exactly. There were lots of those moments. And sometimes we did do scenes together and it actually was basically apple boxes and raised platforms. We cheated it very easily. There's loads of ways to do it. If there is a scale problem, Peter is the man for the job because he knows how to do it all. He's been doing it for so long. I can imagine the attention to detail in every single take is so important, especially to Peter. Speaking about Immortals and The Hobbit, your filmography so far has put you in a lot of mythical and sort of fantastical and god-like or simply God roles. Are these the kind of roles you are actively seeking or are they just the ones coming to you? Are there roles that you really want to get that you haven't landed yet? Evans: It's interesting… When Clash of the Titans came along it was my first movie, so I wasn't going to be saying yes or no to that. When Immortals came along, to upgrade to Zeus, in one way it was, "Hmm, should I be playing another god?" But then the script and the storyline was so, so different to what Clash of the Titans was. It was a very different version. I thought, "Great." But then I was like, well, "No more gods after that." And then, since then I've done Bard the Bowman and… things. But sometimes you go looking for projects and characters, and then sometimes roles come to you and they pop out of the blue and you are like, "Oh, okay, I could do that," and it just works… It's a very organic process, I've found. Also, playing the bad guy in Fast Six this year was a really great thing and a wonderful experience because it was contemporary. It was a really great role and I really enjoyed playing him. That was good. It is about mixing it up. The truth of the matter is roles like James Bond are the ones that I look up to as probably the best roles ever to play. So that's probably my ultimate goal one day, to play James Bond. That would be awesome. So what is your interest in Dracula Untold (directed by Gary Shore) and what is your interest in The Crow remake (directed by F. Javier Gutiérrez)? Evans: Well, with Dracula it was the fact that it was the untold story of how Dracula came to be in the first place. So we're focusing not just on the fictional vampire. We're dealing with the real historical figure of Vlad Tepes, who was Vlad the Impaler. And so, we're back in the 1400's when you meet this man who was the king of his land who had reigned peacefully for 10 years. And there's a lot going on there… And then through his life and experience he's forced to make decisions and sacrifices in his life which ultimately turn him into this creature. I don't want to give it away too much, but… It's sort of an origin story, but it's really the story of Vlad the Impaler and what he does and the things that happen to him in his life that show you how Dracula is born. And that's basically it. And with The Crow… There were a lot of reasons why I thought it would be a good thing to do, mainly the director who is doing it is a Spanish director named Javier Gutiérrez, who is a real artist and really cares about the delicacy of storytelling. His work speaks for itself. That really was what drew me to the movie, as well as the script, which was really great. It was very different to what the original is. And then the fact that they were going back right to the source material, to comic books, the original comic book story, and sticking as loyally to that as they could, which means it immediately will be different to the original film. Obviously, you don't want to replicate the film. What's the point? It was a great film. Brandon Lee did a great job. It's about telling a different story of that character using the original themes of the James O'Barr graphic novel. So that's what drew me to it. I'm getting very excited about it now because that's my next project and I'm able to… I've cleared my head of Dracula and now I'm filling it with The Crow. I'm looking forward to both of those. Thank you for your time, I do appreciate it. Best of luck. Evans: Have a nice day. Bye-bye. A very big thank you to Luke Evans for his time. And thank you to Warner Bros for arranging. Watch my Immortals interview with Luke in 2011. Peter Jackson's The Hobbit: The Desolation of Smaug, the second movie in the trilogy adapted from Tolkien's novel, hits theaters December 13th. Catch it on the big screen! Thanks for the interview Alex! Seems like a nice guy. Looking forward to The Hobbit! Evans is way too under rated. He is great in everything. His performance in HELLBOY 2 was fantastic.